Starting with the base coat of pale green, the "correct" color is supposed to be Tamiya J.A. Grey (XF-14). This was a little too green for my taste, I mixed in some Tamiya Medium Grey (XF-20) and Flat White (XF-2) in a ratio of 3:2:2 to get this wonderful pale green. Also, I took this photo while experimenting with a new 50mm lens I bought for my Nikon. I would like to take all of my work in progress shots like this but it's much easier to grab my iPhone and snap a few quick pictures. I managed to get most of the front skirt painting done last night. It's pretty much done except for a couple of black panels on the top grey section. All and all, I'm not entirely happy with it. I decided to use chipping fluid instead of liquid mask applied with a sponge. It's not bad, it's just not the finish I was aiming for. I guess it will be cool because the chipping on the skirt is going to be different than the hull, where I will be using liquid mask. 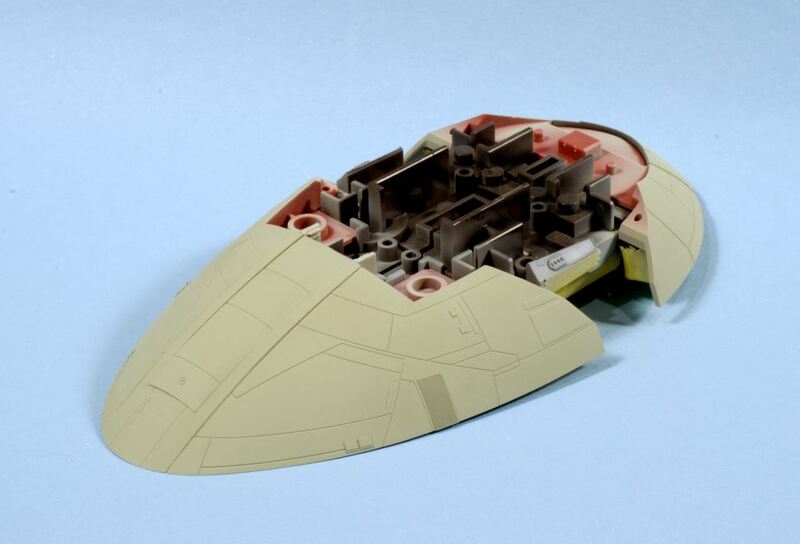 The colors I used were Hull Red (XF-9) and Buff (XF-57) for the red, Pink (X-17) for the chipping, German Grey (XF-63) over Medium Grey (XF-20) for the grey panels, and Vallejo Model Air Tank Brown (71.041) for the brown panel. After this picture was taken, I managed to get a panel line wash on with MIG Dark Wash enamel. Once that is sealed in with some matte varnish, I'll move on to more weathering.